With just 54 days to go until the 2014 TT races, it’s the Supersport class that has proved the most popular in terms of entries. 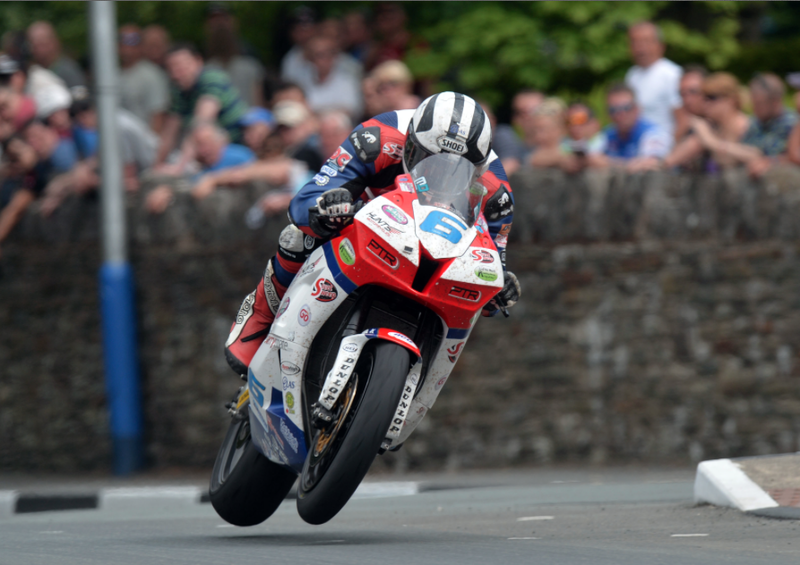 Michael Dunlop is heading back with big plans to make his mark on the class. Here’s the full press release from the TT press office. You’d be foolish to bet against this man on a 600. After recently announcing the starting order for the 1000cc classes at the 2014 Isle of Man TT Races, fuelled by Monster Energy, race organisers have also confirmed the Supersport startlist and as with the other races, a competitive grid will assemble on Glencrutchery Road later this year. Michael Dunlop made the class his own twelve months ago when, riding his own MD Racing Honda, he produced two blistering performances to take a resounding double, the second race seeing him shatter both the race and lap records, the latter rising to an incredible 128.666mph. Continuing to run his own Supersport venture in 2014, Dunlop will again start at number six and he is targeting a stunning 130mph lap in the middleweight division. Rivals to Dunlop’s supremacy are spread throughout the top 20 seeds though and, with races in previous years being determined by ever-decreasing margins, it could well need a lap of that magnitude to win. Fellow Honda riders John McGuinness and Bruce Anstey will line up as team-mates for Padgetts Motorcycles at numbers 1 and 5 respectively, with the Kiwi having pushed Dunlop hard in both Supersport Races 12 months ago, especially the second where he led for much of the way. Anstey also won a memorable 600cc Race in 2012, getting the better of Cameron Donald by just 0.77s. Four-time Supersport race winner Ian Hutchinson will have a great chance of making it five on his Milwaukee Yamaha, once again starting at number 3, and while it’s been six years since he last rode a 600cc machine and only his second TT, his team-mate Josh Brookes cannot be discounted out at number 14, the Australian having finished third in the 2008 World Supersport Championshi. Tyco Suzuki riders Guy Martin and William Dunlop will again resume their challenge with the number 4 and 8 plates respectively and although the Suzuki hasn’t challenged for race wins in the last few seasons, Dunlop is a master of the 600cc class. Smiths Triumph are a new name to the TT but the 2012 British Championship winners will be focused on race wins and Gary Johnson should give them their best chance from number seven. Teammate Michael Rutter will have his first Supersport outings at the TT since 2009 and, as a result, starts lower down the order at 15. Keith Amor is another exciting top ten prospect at number nine and the returning Scot, back at the TT for the first time since 2011, has a great chance of adding to his haul of five podiums. James Hillier will again be Kawasaki’s main hope at number 2 whilst Conor Cummins, riding a Jackson Racing Honda, sets off from his regular number 10 slot. As with the 1000cc class, Dan Stewart, Dean Harrison and Lee Johnston take numbers 11-13 with Bradford’s Harrison surely having a great shot at a win on the Mar-Train Racing Yamaha, the team having taken Stuart Easton to British Championship success in 2013. David Johnson and Dan Kneen stay at numbers 16 and 17 respectively but, as expected, there are some changes in the top twenty compared to the 1000cc races with Jamie Hamilton, Daniel Cooper and Robert Wilson the final seeded riders being rewarded for some strong results in 2013. Outside the top 20, race order will be determined by qualifying times but numbers to look out for include Jamie Coward, Simon Andrews and Ivan Lintin at 23, 24 and 25, local rider Ryan Kneen (29), three-times British Supersport champion Karl Harris (35) and Jimmy Storrar (40). A number of former Manx Grand Prix riders will also be taking part for the first time most notably James Cowton (37), double Junior race winner Michael Sweeney (50), Colin Stephenson (58), Connor Behan (72), Christopher Dixon (73) and Rab Davie (75), the latter having been a stalwart at the Manx since 1998. With a notable 99 approved entries, a new record for the Supersport class, it’s proved to be the most popular class at TT 2014 although the only newcomers are Alan Bonner (98) and Laurent Hoffmann (99).